Raymund Ribay Gutierrez is the first Filipino director and screenwriter to compete for the Palme d'Or twice in the short film category at the Festival de Cannes. Gutierrez's first short film Imago (2016), received a nomination for the Palme d'Or Best Short Film in Cannes and won Best Short Cuts at the Toronto International Film Festival, the Best Short Film Award at the Stockholm International Film Festival, and Best Short Film at the London Short Film Festival. In 2018, his second short film, Judgement (2018), received a nomination for the Palme d'Or Best Short Film in Cannes and has been selected for this year's Toronto Film Festival, 2018. Gutierrez and Mendoza sat down with I AM FILM following Gutierrez’s second Cannes selection, to discuss their unique process of working together as mentor and mentee, and Gutierrez’s spiritual advice on how to keep everything in perspective, as a break-out 25-year-old auteur director. Raymund: The first short film I made is Imago. It’s about an ambulance chaser; a mother whose work is to find dead people at the hospital and sell them at the funeral parlour. How I came up with that story is that during my research, I consulted with my mentor, Brillante Mendoza, using a specific structure we have for creating stories. First, we find stories to tell. After that, we talk about it a lot and make sure that it’s worth telling. And after, if it goes to the second stage, the third stage we go into is the script writing. During this stage, I work closely with Brillante, because it’s a very long process. It takes maybe six months to one year, because, sometimes, what I write is not what I envision. So, most probably, I go back to my research and rewrite. Brillante: Directing is a constant revision, actually. I have a mentor myself, even though I am mentoring him (Ray). I have a mentor who reviews the script. So, sometimes, it’s ok with me, but it’s not ok with my mentor. We do everything together and discuss it amongst ourselves. Raymund: For me, I’m very lucky to have them both, even though, sometimes, they argue. They have different opinions. I tend to mix their opinions and come up with my own. It’s teamwork, after all. After that, there’s the production stage. Even though we are shooting the film, their team is also my team and also my friends, actually—we’re the same age. What was it about these stories that was personal for you? Why did you want to tell them? The second short film that I made called Judgement is about a battered wife who gets abused by her husband. A lot of these things happen in our neighbourhood. People in our neighbourhood just don’t take action on it, and it somehow becomes a way of life. I cannot help it, but, I’m really bothered by the situation, actually. These victims of domestic violence—they file a case and press for charges, but, at the end of it all, the complexity of justice is more painful and abusive, than the actual pain that they are experiencing from their husbands. So, they tend to stop (pressing charges) and they just ask for money, and then, after they ask for money—they just go back to their normal life again. It’s an endless cycle. So, I don’t really intend (anything) in my process of filmmaking; I don’t choose what story I will tell. It’s a matter of instinct and it’s a matter of what’s happening at the moment. When there is something you hear and you see and your heart loves it, in a way, I cannot explain it really, but it somehow gets you, and bothers you at the end of the day. Then, I have to say something about it. My craft as a human being is as a visual storyteller. If I were to fast-forward to five years from now, do you have a vision for the kind of films you would like to make? Raymund: I have a similar perspective to Brillante, that’s why I chose him and I’m very lucky to be his student. I want to continue telling stories about marginalised sectors; stories that are not given attention by audiences. Five years from now, I can’t really say where I am, in that time. I’ll be in that time, because, every time I make films, I have no expectations for where I will go and I don’t think about what will happen. Brillante: Yes, you don’t glamourise it, you shouldn’t embellish it, and you should get direct to the point. You say what you want to say—in a simple way. Especially, when you are a filmmaker who is into social realism and social issues. 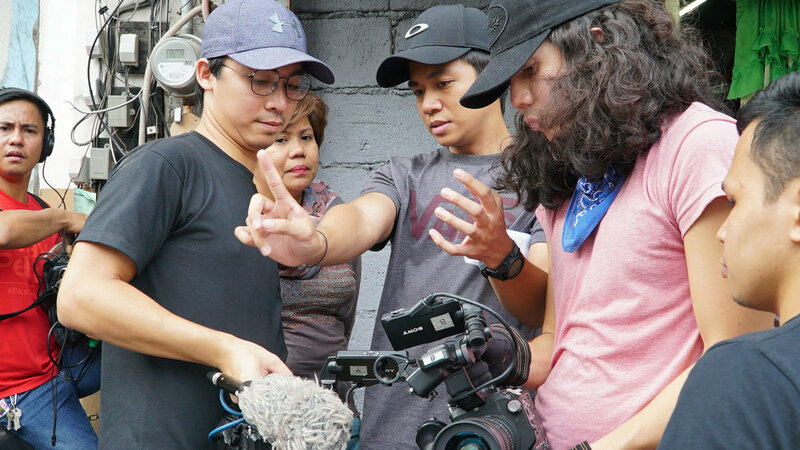 Filmmakers who come from a developing country or a third-world country; who focus on social issues, tend to sensationalise them and put everything together in order for them to be an artist with relevance in the world. Raymund: But what they are doing is the other way around, actually. They are being pretentious. What you see is what you get from my films. I hope, I just, well, actually—I pray a lot. Every time I finish a film, I pray. Brillante: He won the best director. We have a competition in my workshop. You’re asked to make a short film after my workshop, because that’s the one way to see if they’ve learned from the workshop. So, that’s the kind of workshop I give: an intensive workshop for seven to eight days. So, he won the best director award and he was asked in front of so many people, because, we screened the film in a cinema, and he was asked by the journalist, “What was the best thing you learned in the workshop?” And he said, “I’ve learned how to pray.” [laughs] He prayed a lot on every shoot because he was so nervous! Raymund: Just a little background. When I joined this workshop, I had a job in commercials, in an ad agency, so, what I did was—I resigned from that job. I got all the money I could and I paid for the workshop fee, and so, I was broke at that time. So, every time I went to this workshop, I was dead serious about learning. And then, when the workshop ended, I didn’t really know where to go. So, filmmaking is very uncertain. There’s no assurance of where to go. That’s why I cannot say where I will be in five years time. What would you say, as an early-stage director, are the main challenges you face? Raymund: The challenge for me is that many people say the films I am making are similar to the films he (Brillante) was making—the style and the stories. I mean, others are telling me that I have no originality, yet. But, I don’t really get frustrated about that because I’m not really at that stage of life where I should discover my style. I should be focused on the content, rather than the style. I think that’s more important as a filmmaker. Brillante: It’s good that, right now, we have a new chairman in the film development council and he supports him. But it’s not monetary, it’s small things like travel and festivals. But there is no financial support. And investors in the Philippines—of course, we have many investors—but, they don’t invest in art films, they are more into commercial ones. The Philippines has a very thriving film industry, in terms of commercial films and on television, but, we are really on the other side of the fence. And it’s not only for him, it’s also for me as an established film director. It’s a continuous struggle. It’s a continuous challenge that you have to face; that I learned to accept as a part of being an independent filmmaker. It’s not a bad process. Having an award in Cannes doesn’t change anything. When I won the best director in Cannes, I was asked, “So what’s the feeling?” Well, it’s very fun. But next year, there will be another best director. I am not the best director for the rest of my life. So, that goes on and you just have to go on with your life and the things that you like and do not lose the joy of doing and the joy of making films, because at the end of the day, it is the very main reason why we are here—to have fun. And by doing so, we are able to contribute something because of our craft, because of our art, to our audience. Gutierrez is currently working on and raising finance for his first feature film. You can follow Raymund on Facebook and Instagram and Brillante on Facebook and Twitter. To receive more insights from filmmakers and artists on I AM FILM, follow us on Instagram (@iamfilmofficial) #IAMFILM #MastersOfFilm and Join our list to receive more exclusive news and views from the Masters Of Film. Gutierrez's first short film Imago (2016), received a nomination for the Palme d'Or Best Short Film in Cannes and won Best Short Cuts in Toronto International Film Festival, Best Short Film Award in Stockholm International Film Festival, and Best Short Film in London Short Film Festival. In 2018, his second short film, Judgement (2018), received a nomination for the Palme d'Or Best Short Film in Cannes. LUMINARY, NEWSI AM FILM Editor September 5, 2018 vlady gaga, bradley cooper, A Star Is Born, actor, writer, director, filmmaking, Venice Film Festival, oscars, cinema, La Biennale di Venezia, warner bros.